Tallahassee's new mayor John Dailey stands with supporters during his election party. Dailey is leaving his seat on the county commission to take the job. He earned about 51 percent of the vote to beat his opponent Dustin Daniels. 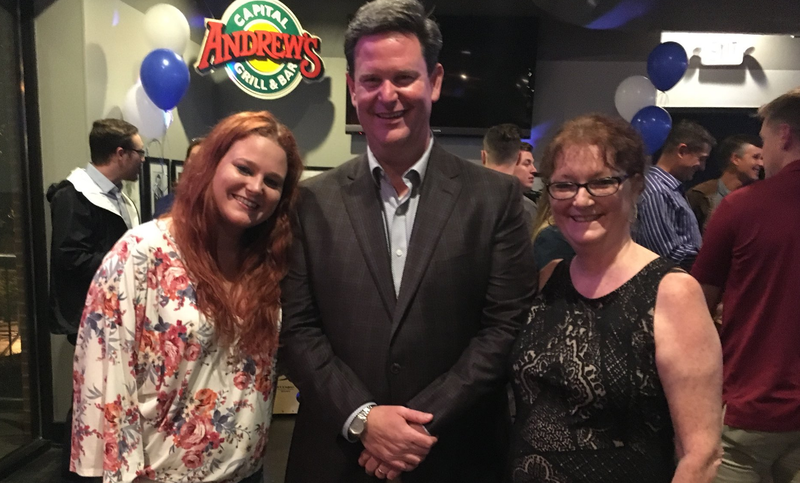 At Dailey’s election party, even before the final numbers had come in, Dailey said he wasn’t feeling many nerves. “No, I’m excited, I’m very excited. We worked very hard. I would not change a thing. We’re right where we want to be. We’re just going to celebrate the evening and watch the returns come in and celebrate the victory,” said Dailey. Dustin Daniels is the former chief of staff to Andrew Gillum. Tuesday night, Daniels thanked his volunteers and supporters, which he called the “lifeblood” of his campaign. “I think the experience was both positive and negative but I think that what I’m proud of is the campaign we’ve run, the messages that we’ve continued to emphasize to the voters in our community, and again, just the volunteers who have lifted us up and helped us along the way,” said Daniels. Both Dailey and Daniels say they had expected the race to come down to the wire.